When you arrive at Beeston Free Church for our service, you will be met by someone from our hospitality team on the front door. These are friendly people to say hello, answer any questions you have, and direct you to a seat in the church. You can grab a Beeston Bulletin that should give you an idea of what’s going on in the week to come. There is a tear off at the back of this sheet where you can sign up for more information at the church if you would like. We do not have an offering but there is a box at the entrance should you wish to give to the work of the church. There will also be other volunteers throughout the building who can assist you in any way-just look for anyone wearing a name badge! 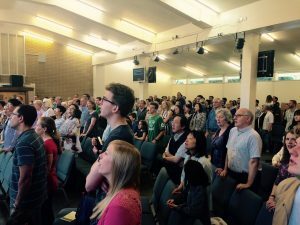 Our church has around 230 members of all ages and nationalities and stages of life. You’ll notice that everyone is dressed differently as well,from traditional church clothes to office casual to jeans and trainers! So however you come dressed – we’re so pleased you are with us! During the summer holidays, the services begin at 10.30am and 6.30pm. Someone will lead the service, where there will be sin ging, praying, and a message from one of our Pastors. The message will be based on the Bible, and aims to be understandable and relevant for people of all ages. It is usually around 30 minutes long, and the whole service lasts about 75 minutes. Our worship reflects a variety of styles and tastes; from traditional hymns to modern praise songs. We welcome kids into our services and love having them join with us in worship. In the service, there are activities for children aged 0-11. Halfway through the service, the children will go to their own classes. 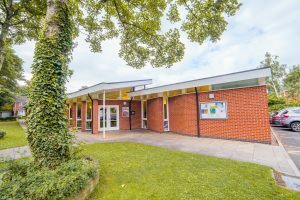 If you go into the foyer, someone will be able to help direct you to the right class for your child. For children aged 0-5 years old we ask that you go and pick your children up at the end of the service. At the end of the service there will be a final song and then we will close with a prayer for which we will stay standing. After the service, there will be a chance to get to know peop le in the church a bit better over coffee, tea and cakes. 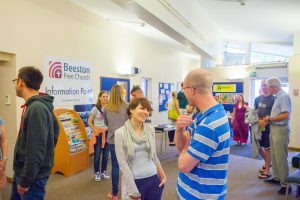 Coming to church is about God and worship, but it’s also about friendship and community, so we hope you’ll stay around and experience a great welcome from Beeston Free members! Please come and speak to one of our pastors who will be standing by the door at the end of each service. We’re always happy to chat and answer any questions you may have! We hope to see you at the weekend!